It is possible to get your offer accepted in a heated housing market, even with a smaller down payment. According to Smart Asset, the average down payment for first time home buyers now ranges between 5 and 10%. 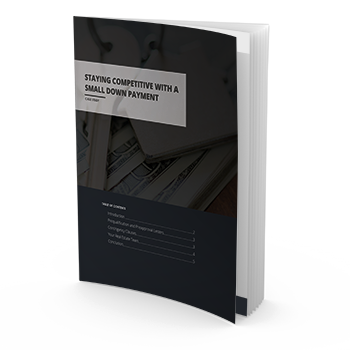 There are steps buyers can take to stay competitive with a smaller down payment. Obtaining a letter of preapproval shows the seller the buyer has already started the mortgage application process and how much they are preapproved to borrow. Removing contingencies can shorten transaction time and expedite the closing process. Leveraging an established real estate team and keeping communication open can help the buyer develop a connection with the seller and stay accessible throughout the lending process. In this case study, we will review the steps buyers can take when putting in an offer with a smaller down payment. Before making any financial decisions, it is best to consult a qualified mortgage professional.